t'irla's talk: Healer! by B.N. Toler: Blog Hop by Wickedly Good Books! Healer! by B.N. 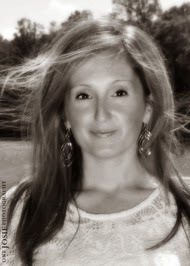 Toler: Blog Hop by Wickedly Good Books! I recently read a wonderful and unique book by a brand new author and was invited to join my first blog hop. 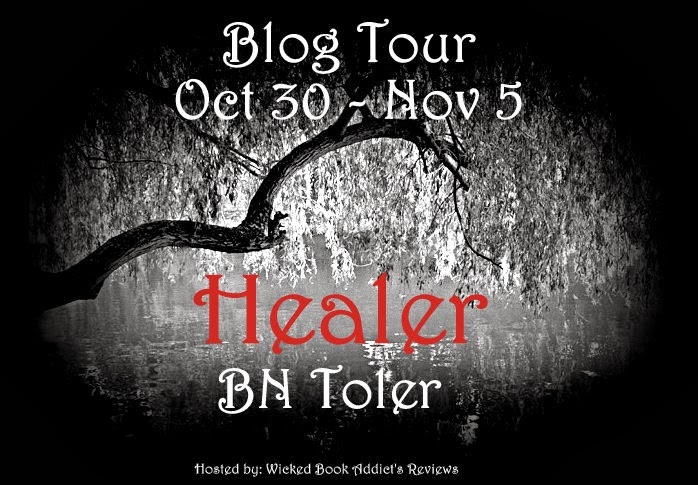 Unfortunately due to illness this is a day and half late but would still like to share with you my interview with the lovely B. N. Toler and some excepts from her wonderful book Healer. Although my review has already appeared here on my blog I wanted to once again share it and remind everyone what a truly unique book this is and how I believe PNR and UF lovers alike will enjoy this first book in The Healer Series. B N Toler's first novel HEALER was released in July 2013. B N Toler lives in Virginia with her husband and three kids and is currently working on HYBRID, the 2nd in the HEALER series. On the side, she is throwing her hat into the new adult/romance genre and working on a novel she will possibly call Chance. Her Favourite books are :The Fever series by Karen Marie Moning, The Sookie Stackhouse series by Charlaine Harris, She is also a big fan of Samatha Young and Sylvia Day. tt: Hi B.N. Welcome to the 'talk thanks for taking the time to visit with me today. As you already know I am a huge fan of Healer and was lucky enough to read and review it a while back. I was concerned when starting the book that it was going to be a Y/A and athough I enjoy N/A characters younger than that don't usually appeal. In Healer though you actually take the characters through a few years of their lives with twists and turns. I loved the uniqueness of the concept and plot of the book and can't wait for "Hybrid"! B.N. :Thanks so much for participating in the blog tour and for taking the time with me. I'm ecstatic about all of it! Yes, Healer is a real mind blower. I swear I thought everyone would figure out what was happening by the middle of the book, and I hated that thought. I wanted to blow some minds and so far, the reviews are saying just that. Hybrid is a different beast though. There will be surprise and suspense just like Healer, but it's written all in present tense. tt: While reading I had a few questions that popped to mind. > How did you come up with the name Aldo? Especially for a girl? B.N. : Allen & Dorothy---These were actually my grandparents names and I always wanted to use the first two initials of their names and name one of my daughters Aldo, but somehow I gave it to the heroine in Healer and that's where it stayed. I love the uniqueness of the name too. tt: Florida? Just wondering why this destination when running away? B.N. : Honestly, I have no idea. I've been a few times in my life and it seemed as good a place as any, but it actually worked out well being that Maela (The Midwife) made her way into the book as a Cuban illegal immigrant. tt: Who or what was your muse for Healer? B.N.:Yeesh! So many people have asked me where the idea came from. To tell you the truth, I have no idea because I started Healer sooooo long ago and actually wrote a completely different version of it unlike what I published. B.N. : I pull from my mind, but I have made a dream cast for the characters. I really think Shailene Woodley from The Descendants fits the image perfectly of Aldo in my mind. > "super power" for your characters as opposed to mind reading etc? B.N. : I really wanted to bring something new and fresh to the genre while keeping what I love most about it. I have always loved paranormal/fantasy and I wanted to create something people would be able to absorb and enjoy while keeping some of the familiar aspects of the genre. Healing as the super power just seemed unique. I loved that the healers could be turned and still walk in the daylight. It really unfolded well now that I think about it because when I started writing this story there were no blood healers. > esthetic choice or was there meaning to that? B.N. 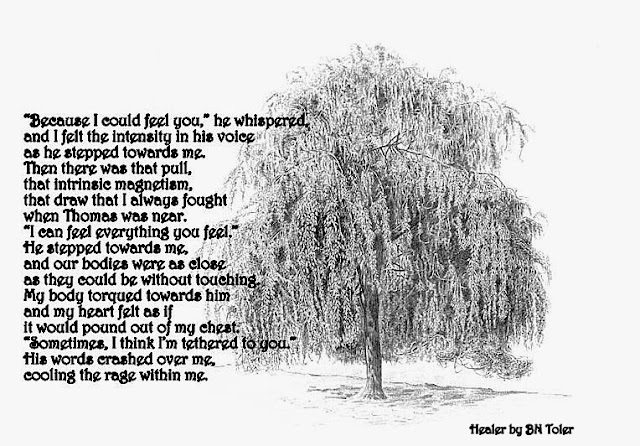 : No the tree isn't particularly meaningful to me personally, but I absolutely love Willow trees. They are just so beautiful and elegant. 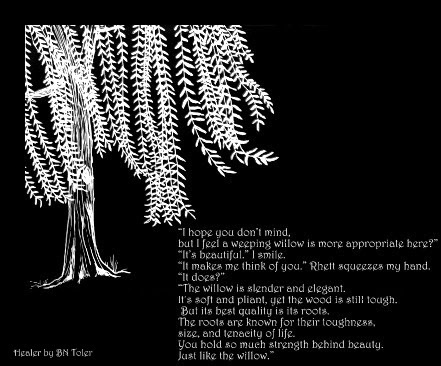 The black and white is a representation of the two worlds Aldo exists with in, conscious and subconscious. 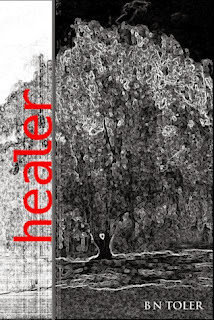 I am actually going to change the cover of Healer and will reveal the new cover hopefully in December. The cover for Hybrid will be released shortly after. > life to put your story into novel form? B.N. : I have always dabbled with it. More of a hobby. But when I finished Healer I just felt like I needed to share it and believe me even after I let a few people read it, I sent it to edit and there was a lot I had to add and remove. God Bless the editors because we writers can get carried away and they have to bring us back down to earth and tell us like it is. > end before putting pen to paper, like a story board? B.N. : I'm probably the most unorganized writer that ever walked the face of the planet. I write, re-write, delete, and change so much it's insane. With Healer, there would be weeks where I would not write waiting for an idea and suddenly, BAM! It would hit me. So maybe a little bit of everything is how I get a story down. I'm really happy with the way Healer turned out. I re-read it sometimes and wonder what I could've added to it or changed, but I still love it..
tt: Thanks so much for spending time with me here on t'irla's talk. B.N. : Thanks for having me and I can't wait to see what you think of Hybrid! 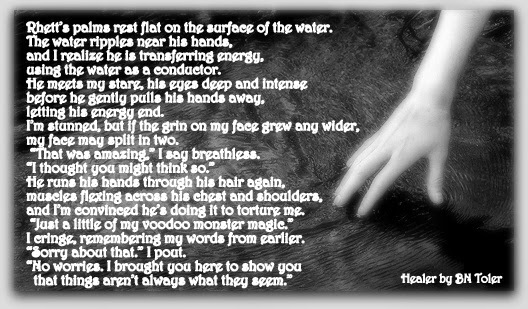 Now an excerpt from Healer! Have we caught your attention yet??? No? Ok one more quick excerpt!! I've heard so many good things about HEALER. I read your review a while back but this reminded me it needs to be at the top of the TBR. Thanks! And thank you, B. N., for giving us a unique vision on "powers." Very much looking forward to this. Thanks again for the rec, T.